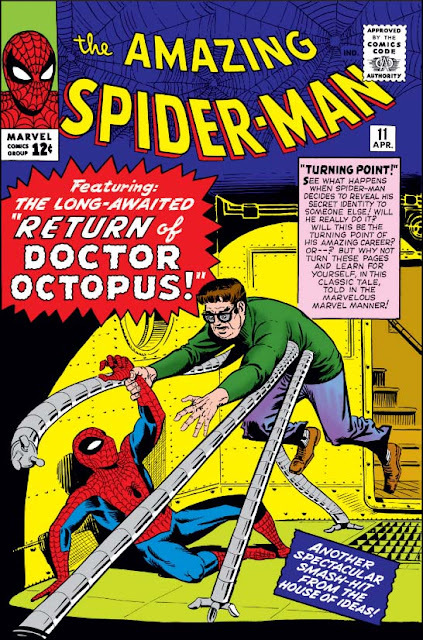 In this action-packed issue, we've the return of Doctor Octopus! Captured in issue #3, he's out early on good behavior, and Peter's protestations to the warden fall on deaf ears; after all, they can't keep a criminal who's served his time. (Though we can sympathize with Spidey, his passionate plea to keep Ock locked because of what he might due is subtly disturbing.) But that's not the only return to be featured, for we also learn the secret that Betty Brant was hiding, and which so frightened her that she felt compelled to leave town. This may have been one of the earliest concrete character stories in the early Marvel U, as it was first hinted at in Amazing #9, developed the next month, and answered here: two issue of setup, then the payoff. Top to bottom, left to right: That's a fair amount of action in one panel! But note how cleanly and simply all that information is delivered. And what a complex story it is! Betty, it turns out, has been doing what she can to aid her lawyer brother who has been coerced into helping mob man Blackie Gaxton. Blackie, in turn, has hired the newly-released Doctor Octopus to break him out of prison - which the demented Doc only agrees to in order to use the mob money to set himself up as New York's newest crime boss. Even the sideline characters are more than just background, for when Spidey crashes the party and chaos ensues, Gaxton's nameless henchmen decide to use the confusion as a smoke screen and flee with the cash themselves! It's an unusually tangled web in which Spidey finds himself - but with the talents of Lee & Ditko spearheading the proceedings, we're never confused. It may be a chaotic tale of crime gone awry, but it's carefully controlled chaos. Out of all this chaos, however, comes a terrible aftermath. When Betty's brother is shot during the confusion, Betty lashes out at Spider-Man for his role in letting such a tragedy occur. Though she loves Peter, she rails at Spider-Man in her grief, full of rage and recrimination. (And note how this is clearly the inverse of our hero's relationship with Flash Thompson, who idolizes Spider-Man but looks down on lowly Parker.) Fortunately, Stan has the subtlety of pen to pull her back from such histrionics once she's calmed down, ensuring that she stays a real character and not a contrived caricature - but a layer of complexity has surely been added. Before the mayhem ensued, the lovesick Peter, overjoyed at having found Betty again, had resolved to confess to her his other identity. Now, he realizes that the merest mention of Spider-Man would only cause her fresh grief - and he knows he can never confide in her like that without imparting untold pain. 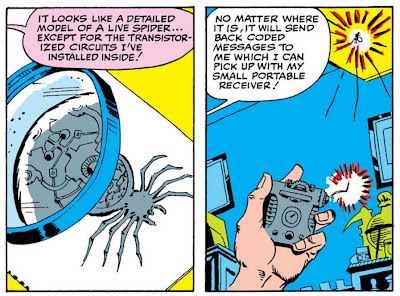 On a more trivial note, this issue sees the debut of one of Spidey's most well-known tools: the spider-tracer! It's not always emphasized in every story, but Peter's really something of a scientific genius, well beyond the innocuous "science nerd" portrayal his high-school self usually receives. 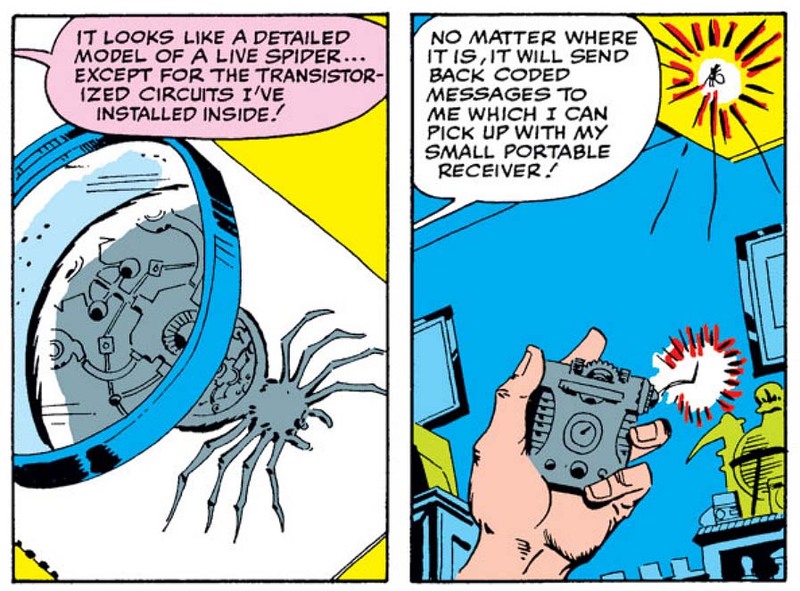 After all, in his first appearance he created a brand-new chemical, his amazing web fluid - as well as the mechanical web shooters designed to propel them! And now, since he needs to follow a villain on the run, he designs a tracking device out of the blue. And all of this from a kid still in high school! The implication is that even if this awkward teenager who constantly struggles to fit in had never been bitten by a spider in some freak accident, he still would have made a name for himself. What amazing talents, the book seems to ask, might each of us have hidden inside? and in scenes like these he really excels.